Joubert syndrome (JS) is characterized by episodes of abnormal respiratory pattern, oculomotor findings, hypotonia, ataxia, developmental retardation with evidence of neuropathologic abnormalities of cerebellum and brainstem. This clinical entity is underreported with a prevalence of less than 1 in 100,000. Only about 200 cases have been reported worldwide. It is a syndrome with a variable phenotype making it difficult to establish the exact clinical diagnostic boundaries of the syndrome. Even though the clinical features of the disorder are present in the newborn period, the correct diagnosis is often not made for several months or years after birth. The average age at diagnosis is 33 months. The importance of early detection of the syndrome is stressed so that suitable measures can be started as early as possible. A comprehensive review of literature is also presented. A 7-month-old girl presented to the pediatric outpatient clinic with developmental delay and abnormal eye movements. Abnormal eye movements were noted shortly after birth and involved episodic deviation to lateral extremes of gaze, usually alternating and lasting for a few seconds. The movements were not accompanied by any change in color and activity and were present throughout the day. In between these movements, the child was unable to fixate and follow objects visually. Parents also noticed that the child was not able to keep up with developmental milestones. She had social smile at 3 months and head control at 5 months of age and was unable to sit even with support. There was no history of seizure, abnormal breathing pattern, feeding or swallowing difficulty. She was born at term to non-consanguineous parents and suffered no significant perinatal asphyxia. She was the only child of her parents. On examination, she appeared awake, alert, only inconsistently focusing visually. Intermittent movements of eyes to extremes of gaze were noted throughout the examination. She interacted with her parents and had social smile. She had no neurocutaneous markers. Ocular examination was normal. She showed mild facial dysmorphism in the form of forehead prominence, deep-set eyes, bilateral epicanthic folds and low frontal hairline. There was no organomegaly. Heart and lungs were normal on auscultation. Neurological examination revealed normal cranial nerves and fundus. Motor examination revealed hypotonia with normal tendon reflexes. Head circumference was normal for age. The axial T1-weighted and T2-weighted [Figure 1] Magnetic resonance (MR) images showed abnormally oriented and thickened superior cerebellar peduncles that resulted in a molar tooth configuration. The more caudal T2- and T1-weighted axial MR images [Figure 2] showed the fourth ventricle shaped like a bat wing. Furthermore, T2-weighted axial MR images showed hypoplasia of the vermis which resulted in median approach of the two cerebellar hemispheres but without evidence of a posterior fossa cyst [Figure 3]. Based on clinical and magnetic resonance imaging (MRI) findings, diagnosis of JS was made and parents were counseled. Follow-up at 9 months of age revealed that she is able to sit without support and has no truncal ataxia or titubation. Hypotonia has diminished. Irregular breathing pattern in infancy (intermittent tachypnea and/or apnea). Our patient had all the clinical symptoms with the exception of breathing abnormalities which may have been overlooked. This syndrome is classified into two groups on the basis of presence or absence of retinal dystrophy. Patients with retinal dystrophy have a higher prevalence of multicystic renal disease and these patients also appear to have decreased survival rates compared with those of patients without retinal dystrophy. There was no evidence of retinal disease on ophthalmological examination in our patient. Developmental outcome in JS is variable. Steinlin et al. suggested that outcomes in JS can be divided into three courses: first, children who die young; second, patients who survive but are severely developmentally delayed and have a variety of visual and motor handicaps; and third, patients whose developmental quotients fall within the mildly delayed range (70-80). Pathological studies  in these patients have shown that the cerebellar vermis is hypoplastic and the dentate nucleus is fragmented. The ponto-mesencephalic junction is dysplastic, with abnormal decussation of the superior cerebellar peduncle and elongation of rostral fourth ventricle. There is a decrease in neurons of the basis pontis and reticular formation. In the medulla, the inferior olivary nucleus, tractus solitarius, the nucleus and spinal tracts of trigeminal nerves show evidence of hypoplasia. The posterior median sulcus and pyramidal decussation are not present. Besides, there is neuronal enlargement in the nucleus gracilis and cuneatus. Once a diagnosis of JS is made in one neonate or an infant, the diagnosis of this syndrome can be made by looking for the specific imaging findings at ultrasound during a subsequent pregnancy. Renal and retinal dysfunction can be progressive. In patients with retinal anomalies, the renal function should be monitored regularly and ultrasonography should be done to detect cystic renal disease. Finally, the diagnosis is important for future procedures that require anesthesia. These patients are sensitive to respiratory depressant effects of anesthetic agents like opiates and nitrous oxide. Hence, the use of these anesthetic agents should be avoided in these patients. 1. Joubert M, Eisenring JJ, Robb JP, Andermann F. Familial agenesis of the cerebellar vermis. A syndrome of episodic hyperpnea, abnormal eye movements, ataxia and retardation. Neurology 1969;19:813-25. 2. 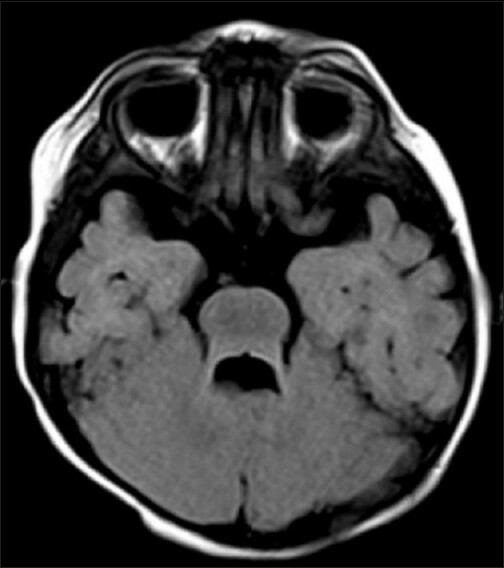 Choh SA, Choh NA, Bhat SA, Jehangir M. MRI findings in Joubert syndrome. Indian J Pediatr 2009;76:231-5. 3. Akcakus M, Gunes T, Kumandas S, Kurtoglu S, Coskun A. Joubert syndrome: Report of a neonatal case. Paediatr Child Health 2003;8:499-502. 4. Maria BL, Quisling RG, Rosainz LC, Yachnis AT, Gitten J, Dede D, et al. Molar tooth sign in Joubert syndrome: Clinical, radiologic, and pathologic significance. J Child Neurol 1999;14:368-76. 5. Saraiva JM, Baraitser M. Joubert syndrome: A review. Am J Med Genet 1992;43:726-31. 6. Kendall B, Kingsley D, Lambert SR, Taylor D, Finn P. Joubert syndrome: A clinico-radiological study. Neuroradiology 1990;31:502-6. 7. Steinlin M, Schmid M, Landau K, Boltshauser E. Follow-up in children with Joubert syndrome. Neuropediatrics 1997;28:204-11. 8. Parisi MA, Glass IA. Joubert syndrome. In: GeneReviews at GeneTests-GeneClinics: Medical Genetics Information Resource. Copyright, University of Washington, Seattle. 1997-2006. Available from: http://www.geneclinics.org or http:// www.genetests.org. 2006. [last cited on 2010 Nov 1]. 9. Barkovich AJ. Pediatric neuroimaging. 2 nd ed. New York, NY: Raven; 1995. p. 249-57. 10. Egger J, Bellman MH, Ross EM, Baraitser M. Joubert-Boltshauser syndrome with polydactyly in siblings. J Neurol Neurosurg Psychiatry 1982;45:737-9. 11. Aslan H, Ulker V, Gulcan EM, Numanoglu C, Gul A, Agar M, et al. 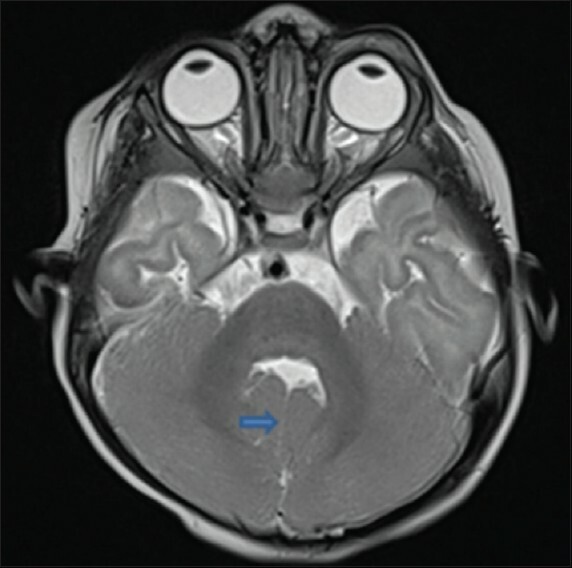 Prenatal diagnosis of Joubert syndrome: A case report. Prenat Diagn 2002;22:13-6. 12. Chance PF, Cavalier L, Satran D, Pellegrino JE, Koenig M, Dobyns WB. Clinical nosologic and genetic aspects of Joubert and related syndromes. J Child Neurol 1999;14:660-6. 13. Maria BL, Hoang KB, Tusa RJ, Mancuso AA, Hamed LM, Quisling RG, et al. "Joubert syndrome" revisited: Key ocular motor signs with magnetic resonance imaging correlation. J Child Neurol 1997;12:423-30. 14. Van Beek EJ, Majoie CB. Case 25: Joubert syndrome. Radiology 2000;216:379-82. 15. Gleeson JG, Keeler LC, Parisi MA, Marsh SE, Chance PF, Glass IA, et al. 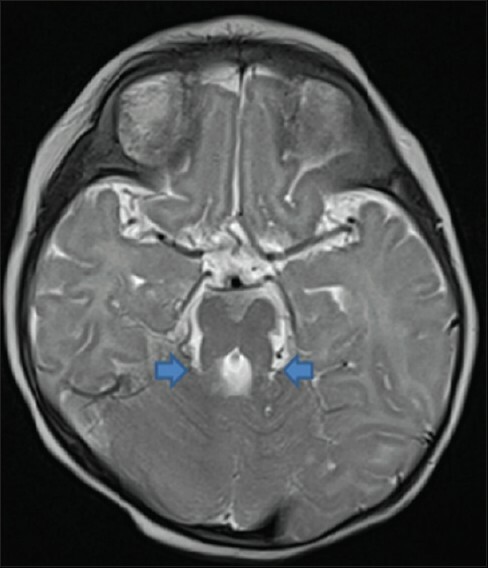 Molar tooth sign of the midbrain-hindbrain junction: Occurrence in multiple distinct syndromes. Am J Med Genet A 2004;125A:125-34. 16. Brancati F, Dallapiccola B, Valente EM. Joubert Syndrome and related disorders. Orphanet J Rare Dis 2010;5:20. 17. Yachnis AT, Rorke LB. Neuropathology of Joubert syndrome. J Child Neurol 1999;14:655-9. 18. Habre W, Sims C, D'Souza M. Anaesthetic management of children with Joubert syndrome. Paediatr Anaesth 1997;7:251-3. Akhondian, J. and Ashrafzadeh, F. and Beiraghi Toosi, M. and Moazen, N. and Mohammadpoor, T. and Karami, R.